Part two of my garbage-themed science travel series. This week, a place I visited after seeing it on a documentary. 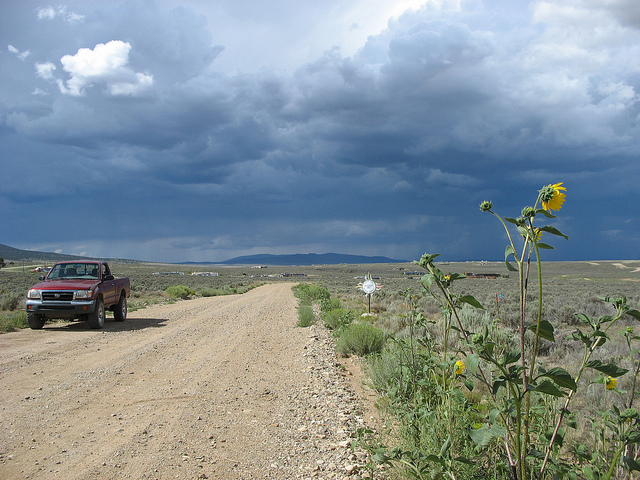 In 2007, I saw the documentary Garbage Warrior at its premier at the Hot Docs film festival, and three years later it inspired a detour to Taos on my way to a conference in Albuquerque. Garbage Warrior tells the story of Michael Reynolds, a renegade architect who developed a way to build sustainable homes out of garbage. It sounds crazy, it sounds disgusting, but the homes are beautiful and the way they are designed, built, and developed is experimental in not just the architectural sense, but also scientifically experimental: They try things, and if it doesn’t work, they change parts until it does work. Reynolds’ early customers didn’t always understand that aspect of “experimental” and complained when things didn’t work, but over time the buildings have become better and better. 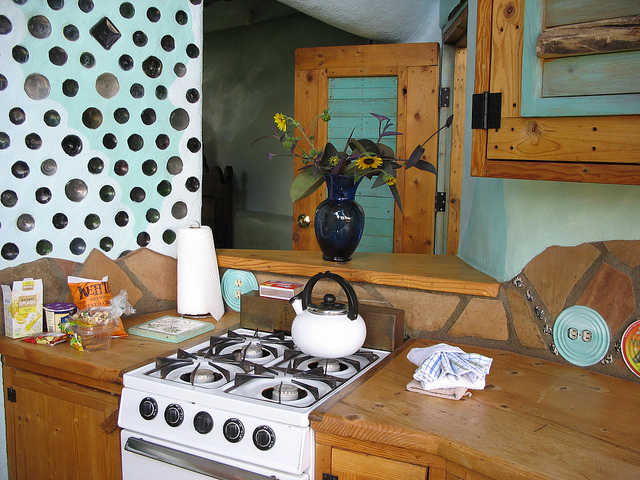 I stayed in this particular Earthship for one night in 2010, in between two conferences. I wrote up my experiences for WorldChanging Canada at the time, so you can read a bit more there as well. 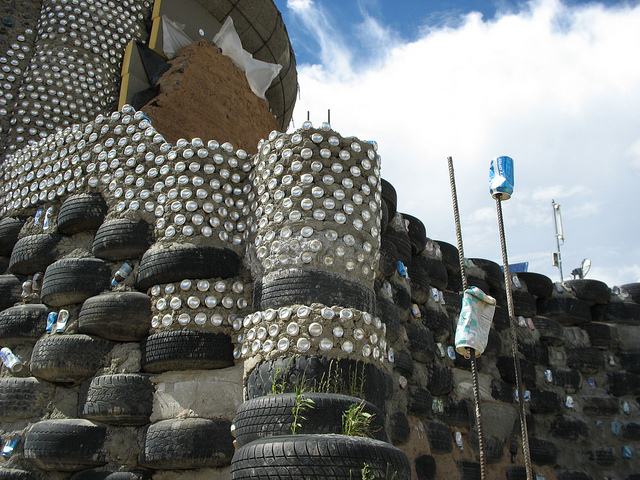 One of my favourite parts of Earthships is how regular garbage is used for structure, insulation, and decoration. 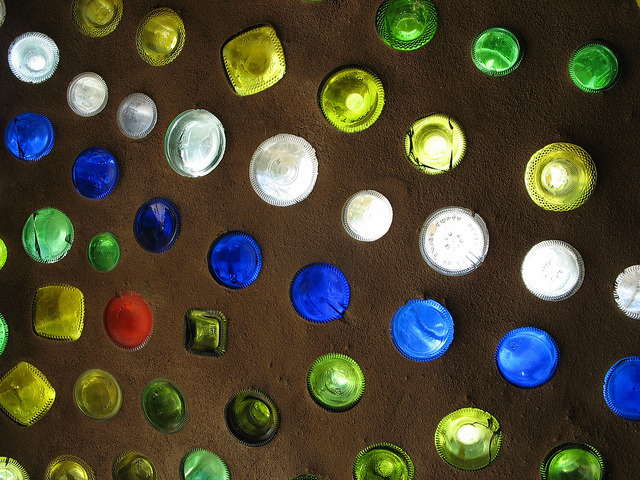 The walls are mainly made of old tires, filled with mud and cans, and empty bottles are sorted by colours and used in the walls to let light in. Demo home on the Taos site, to show what the walls look like underneath the outer layer of clay. Inside planter gets water that drained from sink or tub. My other favourite part is the water system, which is genius: Rainwater is collected on the roof, and filtered for use in cooking or bathing. After that, the drained water is used to automatically water the indoor plants (which help regulate the temperature of the Earthship). Once the water has gone through the planters, it’s used to flush the toilet, and in the final step it’s used for watering the outdoor plants. Four consecutive uses of water, rather than using fresh water for everything! The difficult part in building Earthships is that they very much depend on the local environment to regulate the indoor climate, and that varies per location. 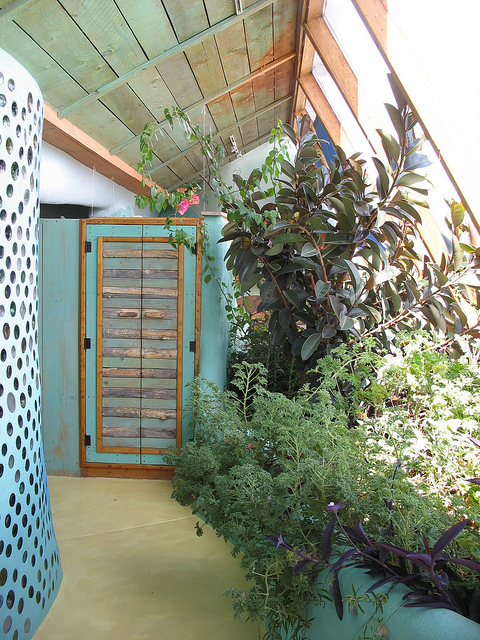 But now they have optimized a global design that should work anywhere in the world, so you, too, can live in an Earthship — if you own a patch of land to build it on. Bottles in the walls, can lids as panels for light switches and outlets. This entry was posted in Have Science Will Travel and tagged Earthship, Garbage Warrior, Hot Docs Film Festival, Michael Reynolds, WorldChanging Canada. Bookmark the permalink.